Unix and Linux treat data streams and peripherals device files as files. By default there are always three files open, stdin (keyboard), stdout (display) and stderr (error messages outputted on the screen). As with every open file, it is possible to redirected the three files. For instance you can redirect (capture) the output of a command, file, script and send it to another command, file or script as input. In UNIX and Linux every open file is assigned a file descriptor. The operating system (UNIX and Linux ) needs to keep track of which files are open and it does this by assigning a number to an open file. (A file descriptor can be considered as a simplified type of file pointer or file handle in C programming language The file descriptors for stdin, stdout, and stderr are 0, 1, and 2. There are also file descriptors 3 to 9, that can be used to open additional files. These remaining file descriptors can be useful to assign to stdin, stdout, or stderr as a temporary duplicate link. That’s the theory behind I/O redirection, so let’s take a look at some examples. Redirect the output (stdout) to a file. The file is created if not present, otherwise it overwrites the file. Redirect the output (stdout) to a file. The file is created if not present, otherwise appends to the file. Let us take a look at some actual examples on the command line of a Linux system. The > truncates a file called somefilename to zero length. If the file is not present, it creates a zero-length file (same effect as ‘touch’ command (touch somefilename)). This command list the content of the current directory and writes the output to a file called listfile. # Redirect stdout to file "filename atorvastatin dose." # Redirect and append stdout to file "filename." # Redirect stderr to file "filename." # Redirect and append stderr to file "filename." # Redirect both stdout and stderr to file "filename." We can use the single line redirections in a script, for instance to echo messages to logfile. (Open een file using vi script.sh and copy the lines below to the file. Run the script by typing: /bin/bash script.sh). Let us take a look at some actual stderr examples on the command line of a Linux system. In the example above we show you a single line redirection that redirects stderr to stdout. Each error messages will be sent to same place as standard output (which default is the screen). To redirect both stdout and stderr (overwriting the file if present). It is also possible to close file descriptors for instance, closing the input file descriptor n.
Closing the output file descriptor n.
That’s all for this tutorial. 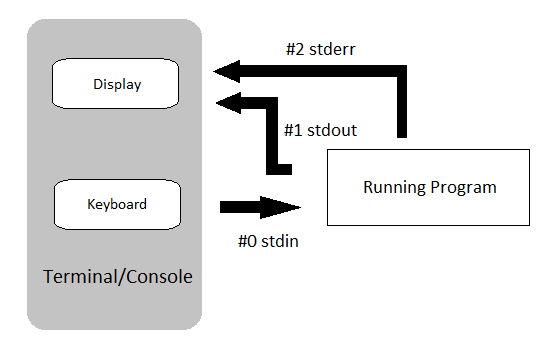 We hope that you now know how to use STDIN, STDOUT, STDERR streams (I/O redirections). See you at the next Linux command-line tutorial. This entry was posted in Linux Command Line. You can follow any responses to this entry through the RSS 2.0 feed. You can trackback from your own site. Tweet This! or use to share this post with others.